These books are my pride and joy, my 21st birthday present from my parents. It's a set of complete Tennyson, published 1872. Tennyson is a great love of my life - in a slightly geeky admission one of my other presents that year was his portrait. Interestingly, his Arthurian stuff is not actually his best, but those last two books, labelled 'Idylls' are the entire Arthurian story. Beautiful, although a little idealised. A few others. That's a victorian copy of the first Idyll (Ignore Shakespeare, he's just jealous he never wrote anything Arthurian), and then a mix of modern and medieval texts. I only read The Mists of Avalon for the first time this Easter and it's BRILLIANT - the entire story from the perspective of the women only. I adored it. Then you have Mark Twain's book, which is one of my least favourites if you're a die hard, but an interesting read for what it says about America. Two medieval ones - the Lais of Marie de France are a collection of 12th century short stories, some of which are Arthurian. They were composed in Anglo-norman so unsurprisingly I read them in translation. They're lovely though - Arthurian tales, magic, and even a werewolf story! Then you can see Chretien, who wrote specifically about the knights, in, again, the 12th century. He was the first writer to really make a character out of Lancelot. Then there's my critical books (bear in mind I studied this!). My less superior Arthurian Encyclopedia, and then two critical books, one on the reinvention of Arthur in Victorian times. It's when people suddenly decided we needed more chivalry again (4 for you, Victorian era, you go Victorian era!). Finally, a book all about Guinevere, who I still love very much. Ok, last home one shelf. 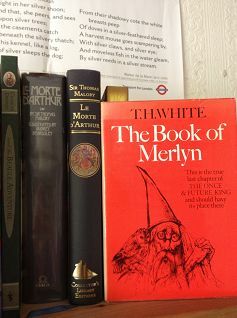 As people grew aware of my great love of the genre, I was lucky enough to gifted two beautiful gift editions of Malory's Morte D'Arthur (the basis for what is commonly accepted to be the Arthurian story). 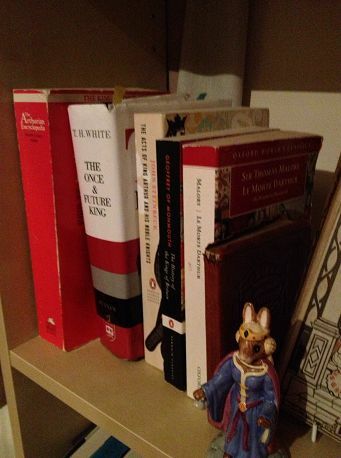 The other book is the final book of The Once and Future King by TH White (more on that below), which was written after the original was published, and is still generally published separately. No one separates me from my TH White. No one. If you're bored of love triangles, read T H White's depiction of Arthur, Lancelot and Guenever. He was the first writer to truly visualise those characters as people, and I love all three of them desperately. It's 4 books, not including the above, and the first is the basis for Disney's The Sword in the Stone film. First book suitable for children. That's my big 'don't mess with me I'm academically weighty' Arthurian encyclopaedia. I've hardly read any of it, but it's useful for checking characters and their different incarnations throughout history. Steinbeck. Very few people know that he wrote this, partly because he died before finishing it. Miserably, I didn't know that when I started reading; the book stops just as Guinevere and Lancelot kiss for the first time. The realisation that I'd never read the rest was physically painful. This is a beautifully tragic book. Steinbeck spent his whole life trying to rewrite the legend but his years as a war correspondent meant he couldn't bring the values and ethics of that world to match with modern morality. History of the Kings of Britain. This is technically the 'history' of Arthur (only a small section dealS with him, this book is the history of the origins of Britain.) It's brilliant if only because it reports myth as part of history - Lear, Cymbeline, Merlin and Arthur are presented as fact. It's incredibly hard to tell what's real, and his writing inspired Malory, who is normally seen as the definitive text. He also inspired Shakepeare - not many people can claim that one. That's my standard edition of Malory. There's not much to say really, everything's there: the battle for England, war with Rome, the love triangle, the disintegration of the Round Table. 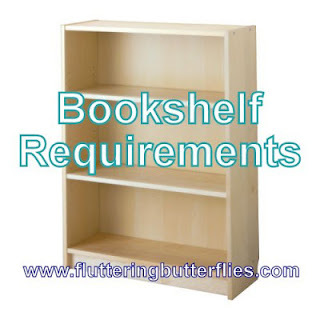 There are so many editions of this available (yes, this is the third copy you've seen in this post!) 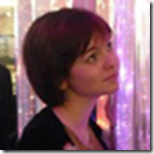 but that one is translated by university supervisor and is brilliant. Finally you can see my beautiful Victorian edition of The Defence of Guenevere by poet and painter William Morris. He was a Pre-Raphaelite so this gets extra points. This is a stunning collection of his poetry and his illustrations, which my mum found for a few pounds. That figurine is a Royal Doulton of Guinevere (if you don't know them, check them out, they do all great themes and stories with rabbits!) which my parents got me as a good luck present when I was in that original play that sparked this geekery off. She's been lovingly superglued from her repeated breaks as she follows me from house to uni room to house. That's them all! Thank you for anyone who's made it this far, through what is essentially a massive fan girling. But if it means you pick up an Arthurian text, I'm thrilled. Thank you Clover for letting me share this great passion of mine! If anyone wants to ask me about any of the books, catch me on twitter: @aitchlove. As you've probably guessed...I quite like talking about them. Thank you so much for that Hannah! Do you fangirl over Arthurian literature too? Your a girl after my heart. Btw if your haven't got it already "here lies Arthur" well worth a read and sure Michelle will back me up. Also I loved Rosemary Sutcliffe's Arthurian Trilogy too. 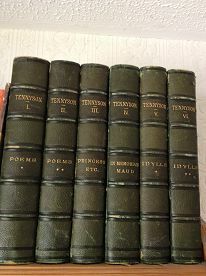 Also I'm green with envy over those editions of Tennyson! This is fab! 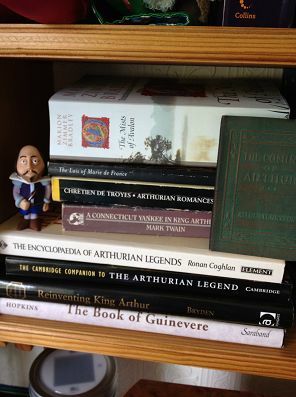 I adored reading Arthurian literature when I was a child and it's always been something I've meant to revisit, now that I'm older and know so many more titles that I want to try. Fantastic post, thank you so much Hannah!